Vail? For your Senior Session... Why not!?!? How are we totally different from every other studio? When seniors are looking for 'different' and don't want their photographs to look like everyone elses, we talk about our Elite sessions. The conversation always starts with the question, "WHERE are YOU the happiest?" For Rose -it was Vail. The wildflowers, the Gore river & the Colorado-Euro-architecture. She loves it all. We made some incredible images and just set the bar REALLY high by creating an amazing experience for Rose with photographs that are just mind-blowingly-beautiful. We cannot wait to show them all to her! — at Vail. A Great Head Shot Should Be USED... Everywhere. We strongly encourage our head shot clients to use their new photographs everywhere and this was in my mailbox this morning! Well done, Tom! We absolutely LOVE supporting Project C.U.R.E. because every hour... of every day... all over the world: they are literally saving lives. Surplus medical supplies from hospitals and companies in the USA are sent on palettes to the Project C.U.R.E. warehouse in Centennial, CO. All this needs to be sorted and shipped to people in clinics and hospitals in developing countries throughout the world. They are so good at this Forbes Magazine named them the 14th Most Efficient Large USA Charity. With a passionate volunteer base nationwide, and nearly 98 cents of every dollar donated going directly to the need (this is off-the-charts in comparison to other non-profits) we know that every hour volunteered and every dollar given will make a significant impact. The warehouse in Centennial,CO is full of medical supplies and much of it has never been opened or sorted. This is where YOU can help them and we can reward YOU: For every hour you volunteer at Project C.U.R.E. we will credit $10/hr toward your portrait order. 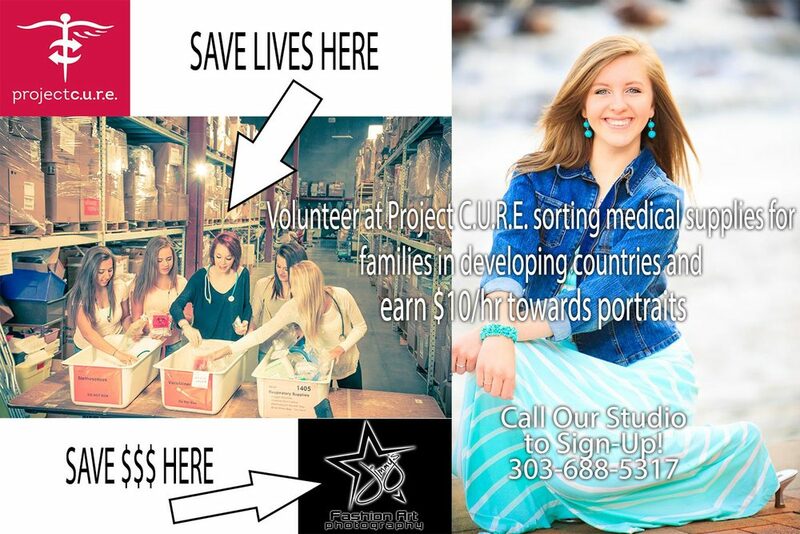 For example: if your family of four volunteer just once for three hours- we credit each hour from each volunteer- and you get $120.00 to spend toward your portraits- ANY student from ANY high school! You can bring a group of friends and everyone participates- its very simple! Call our studio to register for the program (all we need is your contact info), then visit ProjectCURE.org to sign-up. They will track your hours and we will credit you when you order. Simple as that. AND STARTING WITH THE CLASS OF 2015: ALL SENIOR SESSIONS NOW INCLUDE A FAMILY SESSION! Click to read the story featured in Better Living magazine! NBC Nightly News with Brian Williams featured Project C.U.R.E. in their, 'Making A Difference' segment in 2011. Ethiopian children and- generations to come- were saved from a heart defect through a donated heart catheterization machine shipped directly to the one place that needed it the most. Click to watch below! The Happiest Irishman In The World! Dr. James Jackson: founder of Project C.U.R.E., award winning author of 'The Happiest Man In The World', Godly man of great integrity & wisdom... and a fine Irishman who wears a kilt like he belongs on the cover of GQ! @regisjesuiths Class of 2014 senior Andrew oozes with coolness wearing a blue-velvet jacket for his session in Denver! Check out Andrew's session video below! Fall in Colorado "...is like a box of Chocolates..."